Fike Safety Technology has launched the extinguishing control panel Twinflex SRP which can be used as a standalone solution, or can be interfaced to external fire safety systems through its set of monitored inputs and outputs. The panel offers three configuration options for the programmable zonal inputs. Each of the four input zones can be configured as Conventional Detection, Releasing or with Fike’s Twinflex Detection. When configured as Twinflex, the system uses intelligent fire detection devices, which allow multi-function detectors, manual releases, sounders and beacons to be connected on the same 2-wire circuit. This also provides more detailed device and fault type information and can reduce the installation costs compared to conventional detection circuits. Five programmable monitored inputs are provided for connection to devices such as manual extinguishant release call points and switches. 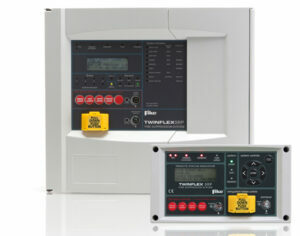 A series of monitored outputs are available for conventional sounder circuits and relay and auxiliary control. Up to eight remote status indicator panels can be connected directly to the control panel via an RS485 interface, allowing system status and control to be provided at multiple locations.